Bright smile greeted the media during the press conference held at Carlton City Hotel. 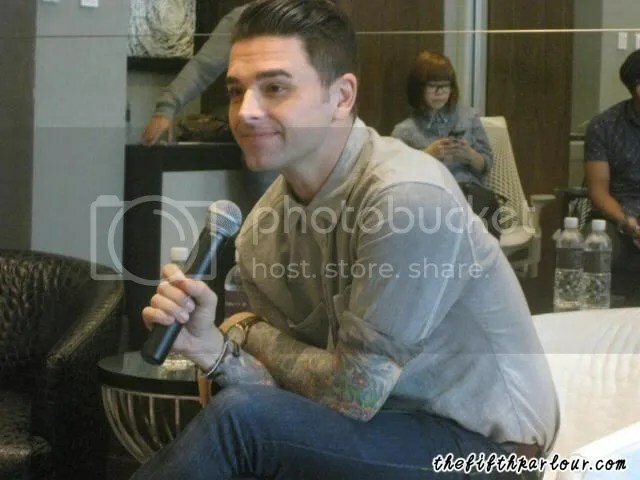 Chris Carrabba mostly known from Dashboard Confessional was in Singapore on Wednesday for his solo acoustic show. Chris mingled with the media before starting the press conference. Chris mentioned that Singapore is one of the most memorable tour when he was touring with the Dashboard Confessional. During the press conference, Chris never fails to lighten up the room with his joke to break the awkwardness. His likable personality just makes you want to listen to him all day long. I’m sure you wish you were at the press conference with us to be able to witness what we witnessed. We hear you and therefore, check out the video below to know what happened during the press conference. Like our Facebook Page to view more pictures from the press conference. Thank you Sprout Entertainment for extending the invitation to The Fifth Parlour. We would also like to thank Dalilah for attending the press conference on behalf of The Fifth Parlour.